If you are searching “where to sell a rolex“, you have come to the right place. Bob’s Watches specializes in buying pre-owned Rolex watches directly from the public so it is often considered the best place to sell Rolex watches. So whether you are exploring where to sell a Rolex watch you no long wear or want, to manage an estate sale, or simply to exchange for a different Rolex model, Bob’s Watches has everything you need to ensure that you get the highest price when selling your used Rolex watch. Recognized as the Rolex Exchange since its inception in 1999, Bob’s Watches is the place to go to sell Rolex watches and to buy luxury watches. Where To Sell A Rolex? When you start asking yourself, “Where can I sell my Rolex?” several ideas will come to mind: newspaper and online ads, consignment shops, and pawn shops. Rather than heading to the local pawn shop, where you can sell a Rolex for $50 or less, the professionals at Bob’s Watches understand the true value of these items and help you to get the highest price possible. Most people do not trust a “Sale Rolex” ad, which is why using a dealer is the best choice. You can sell to a Rolex dealer and get a higher price due to the credibility and authenticity provided by their reputation. Where to sell a Rolex has a lot to do with the price you end up getting. When you sell a Rolex with the luxury watch professionals at Bob’s Watches, the value of your watch goes up. Buyers are more confident about the price when they buy from established experts. When you buy or sell a Rolex, you expect and deserve excellent service. The service and product quality available through Bob’s Watches is all that and more. Everything is upfront. 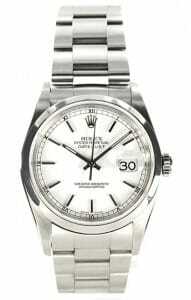 Buy and sell Rolex prices are posted on the website and only the highest quality luxury watches are available. We have earned an A+ rating from the Better Business Bureau and there are countless customer testimonials that demonstrate our commitment to excellence, making us the best choice when you ask yourself where to sell a Rolex. You can save yourself time and trouble when you sell a Rolex through Bob’s Watches today. Working with only the finest time pieces made in the world, Bob’s Watches is the place to go to buy or sell luxury watches. Contact us today for more information about why they are the solution to your ‘where to sell a Rolex’ problem.